Did your phone get UIDAI phone number 1800 300 1947 automatically added to contact list? Is that a problem? 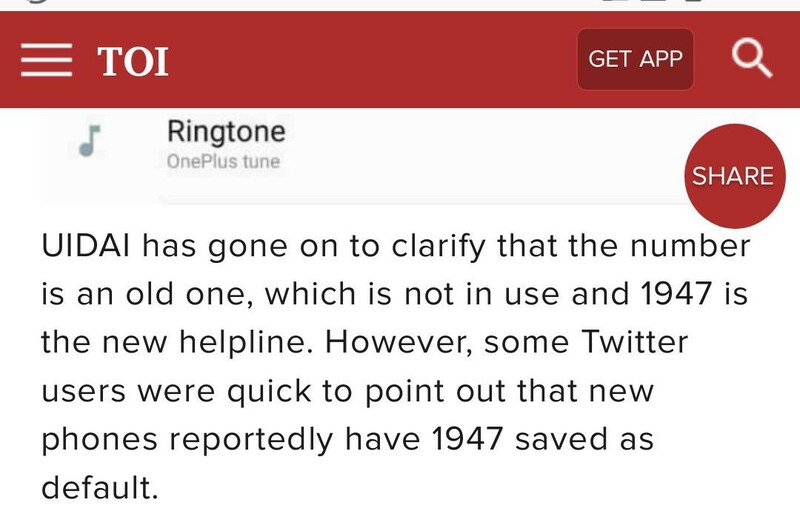 There's been lot of buzz on the Internet about UIDAI phone number 1800 300 1947 getting added to Android phones automatically. People have been complaining about privacy issues at the top of their voice. Why is it a problem, anyway? In my opinion, people are simply over-reacting. Did people complain about the apps that come preinstalled with the phone when you buy it? By the way, Google has clarified that back in 2014 - they added the phone number to Android devices. Let's face it - You're in Google's world and if you don't like what they're offering - go to do whatever they want. They can add numbers to your contact list, they can delete numbers from your contact list; they can retire any app at any time. Let's just learn to deal with it. Simply put, people who believe in WhatsApp forwards are just proving themself an idiot. Not on my android so far. Its there in my phone, but why worry? People just over react on anything if topic is about government.